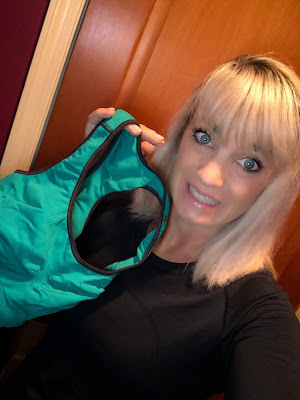 How I got the funk out of my workout clothes, and my teenaged sons' stink out too! I have a sports bra problem. Specifically, I have a stinky sports bra, workout clothing laundry problem. I'm not typically a smelly person (…pretty sure), but recently I noticed that even after washing, my workout clothes were a little, especially my sports bra (which was right under my nose) smelled, well, funky. Or they would smell fine right out of the wash, but as soon as I put them on and started sweating again, things got a little ripe. Ick. Things got even worse when I went for a run, or did hot yoga. When you wear a tank top, sports bra, and leggings for an hour-long workout high heat, then drop those soaking-wet clothes in hamper until the next load of laundry, you've got a recipe for serious stench. No amount of washing with regular detergent would get the smell out. I even washed with Tide Sport, but that did nothing, other than mix the stench with a floral smell. In addition, I'm the mom of two teen boys. If you've ever smelled teen boys, not just their workout clothes, but their every day clothes can crinkle the nose of the most loving mother! Odor in workout clothing is most commonly caused by a buildup of sweat and bacteria from your body. Then, how you store your dirty workout clothes can also lead to additional odors—for example, leaving sweaty clothes in a closed up gym bag, locker, or hamper. (Guilty no longer). In addition, the very qualities that keep high-performance fabrics comfortable during a workout—their ability to push water out of their fibers rather than retaining it, so you stay drier—make it harder for sudsy water in your washing machine to penetrate the fabric and pull the sweat and bacteria out. Turn clothes inside out before washing (since the sweat, oils, and bacteria from your body accumulate on the inside of the clothes). Always use the sniff test before putting the garment into the dryer (although I don't dry my workout clothes, because the heat ruins the elastic/spandex material). Wash clothes as soon as possible after wearing (I do this now, just throw in a load a day). If possible, let sweaty clothes air out immediately rather than stuffing them into a plastic bag or hamper. I ended up testing the list of specialty "stink be gone" detergents and boosters below (five in all). How I did it: I tried each method or specialty detergent at least two times (most of them four or five times), always washing in warm water and hanging dry. Each load had at least one super stinky hot yoga, or hot run item in it. I sniffed everything right out of the wash and after drying, and also noted if clothes smelled worse when worn. I paired the natural methods with my usual laundry detergent, Method, a greener brand. For the specialty detergents, I focused on brands that were also environmentally friendly. My requirements: a liquid whole detergent (not a laundry booster), that words with my front load washing machine laundry soap tray, that gets out the stink, and is environmentally friendly. (I know, I want it all)! OxyClean Odor Blasters: this is a laundry booster, which means it's used in addition to your regular laundry detergent. It sort of worked, but it infiltrated a strong, flowery scent to all my workout clothes, which then I started to smell while working out, and I didn't like. Defunkify: This worked well, however, it is a powder, and doesn't work in a front load washer soap tray. However, it's HE machine compatible, and you can place a scoop of powder right in with the dirty clothes. Biokleen BAC-OUT: This also got the skink out, but is a laundry booster, so used in addition to detergent. This is used for cloth diapers, and it is powerful, but environmentally friendly, and a liquid. Rockin' Green Soap - Well-known for getting the stick and bacteria out of workout wear. It's a powder, so not compatible with the front loader machine soap tray. However, it's HE machine compatible, and you can place a scoop of powder right in with the dirty clothes. The directions state soaking the clothes in a bathtub first, before washing. This is not feasible in my busy lifestyle. FunkAway: another laundry booster (but my favorite). Priced well, de-stinks, and is a liquid! It has a very mild, fresh, clean pleasing scent. However, I have to use it in addition to detergent. I couldn't find one that met all my requirements, but I'll keep getting the FunkAway for the price and effectiveness along with my Method detergent. Using too much detergent is probably the biggest mistake people make when it comes to laundry, and if there’s one place where I can encourage you to kick the habit, it’s when washing sweaty, smelly exercise apparel. Using more detergent won’t leave your clothes cleaner; instead, it leaves a buildup of soap residue that traps odors in clothes after going through the wash.
Use a laundry booster or sports detergent (from my list above). Boosters are used in laundry in addition to regular detergent. For eliminating odor, you can try adding a quarter-cup to a half-cup — again, depending on load size — of white vinegar or baking soda to the wash.
Avoid washing athletic gear, especially if it has stretch in it, with towels, fleece and other linty items, as well as with very heavy garments, like jeans and sweatshirts. Athletic clothes with stretch in them will pick up stray lint in the wash, and heavy items can lead to pilling and damage to more delicate athleisure-wear. Fabric softener leaves a coating on clothing that can lead to odor retention, even in clean laundry. That coating, especially when it builds up, makes it harder for water and detergent to fully penetrate the fibers, trapping odor-causing bacteria. Elastic clothing doesn’t love being exposed to high heat, and that heat will also amplify odors. Wash workout clothes in cold water, stick with the low- or no-heat dryer setting or, better yet, allow exercise clothes to air dry.